In 1972, environmentalists predicted that cars would become obsolete in the 21st century simply due to the lack of raw materials to build and fuel them. A year later, Porsche's engineers replied with the Forschungsprojekt Langzeit Auto, or FLA for short. In the early seventies, the Volkswagen Foundation sponsored scientists Donella H. Meadows, Dennis L. Meadows, Jørgen Randers and William W. Behrens to use the World3 computer model to simulate what humans do the the planet. The resulting book commissioned by a non-profit think tank is known as The Limits to Growth. Unlike the Lexus LFA, the Porsche FLA wasn't built for speed in 1973. It was a car designed to work flawlessly for at least three decades even in the harshest of environments. In order to achieve such reliability, Porsche made a highly corrosion-proof iron-chromium-nickel steel chassis that could be wrapped with aluminum panels that are light but much easier to recycle than any composite. Power came from a rear-mounted 2.5-liter flat-six that produced a modest 75 horsepower at 3,500 rpm, making it unstressed and as fuel efficient as possible. Porsche over-engineered its internals to make it bulletproof. They used hydraulic tappets, a highly efficient air and oil filtration system and an advanced cooling system which allowed the car to reach running temperatures very quickly. The gearbox was a semi-automatic three speed with a waterproof torque converter and massive oil reservoirs to extend the oil changing period. The FLA was fitted with a contact-free ignition system along with wiring split into multiple looms to aid replacement or upgrade. Porsche also fitted aluminum piping instead of copper - again for recycling reasons - along with silver contacts for the spark plugs and between leads. But no matter how great their intention was, the FLA was doomed to end up in the Porsche Museum soon after its premier at the 1973 Frankfurt Motor Show. The team had to realize that the production version would be extremely expensive for such low performance, not to mention that using the same (outdated) technology for three decades is not beneficial for the customers nor the environment. 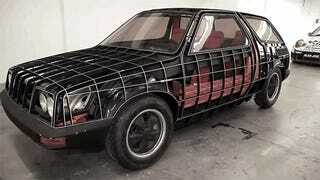 However, thanks partly to experience gained with the FLA, Porsche started galvanizing the 911 with the 1975 model year.